Tetra revolves around modular items and attemps to blend it together with other concepts such as adventure and technology. Tetra allows you to replace parts of items with different parts of different types and materials, some parts can also be improved. Which parts you may use is limited by the items capacity, called integrity. Some parts increase an items integrity while some parts has an integrity cost. Some parts require tools of differing quality to craft. Allows quick access to offhand items. Place items into the toolbelt and quickly put them in your offhand using the v key (configurable). Acient ruins can be found deep underground in cold biomes. Materials and technology can be salvaged from the ruins. Geodes can be found when mining at lower levels and can be cracked open at an upgraded crafting table. Yields valuable items when opened (possible items and probabilities are configurable). I'm available on the forge and MMD discord servers and I've got a channel set up over here: https://discord.gg/Xfwhgzu, feel free to poke me over there for questions/issues that do not belong in the issue tracker. Do you plan on adding other types of weapons and tools? How would I add new materials to craft tools from? Specifically, AoA's rosite, skeletal ingots, shyregem etc. Is there a way to do this from my side? Is there anyway to get Metallurgy 4 Support of the materials there? So... I'm a bit stuck with a T3 Hammer. The parts it has are 2 Iron Mallet Parts + Iron Handle. Blaze Handle requires T4 Hammer, same with the End Rod Handle but I dunno what materials can get you to using a T4 Hammer. Obsidian would do it but it needs a T5 Hammer in order to craft it. The only other possible way is Fiery Metal from Twilight Forest which two Fiery Mallet pieces gets you to a T4 Hammer... but integrity is 6/5 which means you cannot craft it. Blaze Rod & End Rod requires T4 Hammer and those increase integrity to 7 to 8. Can you even get a T4 Hammer with Vanilla Materials? Is there a vanilla material that gives you 6 integrity? Well... Treated wood was a handle option which gives me the 6 integrity that I need. Just needs a T3 Axe which is doable. Ah... will there be enough integrity to attach it? I have a question, though: How does this mod compare with Adventurer’s Toolbox? 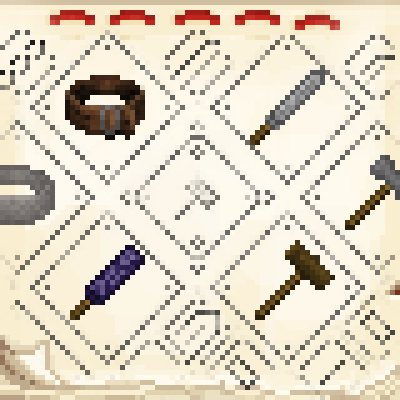 What are the main differences, other than Adventurer’s Toolbox having weapons and tools at the moment? Fantastic! lt's a great idea to make the weapon system better. But the weapons made in this mod are hard to be recognized as weapon. Is there any way to solve it? In any case, I love this mod and look foward to its following version. I apologize for my pool english. I mean, it seems that the weapons are not named with ItemSword. This causes many mods will not effect on the swords in this mod. For example, the Enhanced Armaments mod (https://minecraft.curseforge.com/projects/enhanced-armaments?gameCategorySlug=mc-mods&amp;projectID=298920). Just a little idea, I hope everyone like this mod. Ah, I see. It's difficult to fix that but I can take a look. Is it possible to get 12 Quick-Slots? Currently for the tool belt I'm using Shulker Inlaid Belt with 4-3-3 Iron Loops and Integrity is 8/8 which caps out to 10 Slots. 12 Slots would be 12/8 Integrity. Oooh, which mods are you running if you managed to fill up 10 slots of tools (and trinkets)? Tinker's Weapons + Addons like Battlesigns for blocking, range weapons like Longbow, Shuriken, Yo-Yo & Dart Shooter. You can use these from the off-hand which is nice depending on the situation. Yo-Yo for example can be used as a mob lawnmower or it can act as shears due to a modifier on it. There's also some utilities like the Torch Bandolier from Silent Gems, although that item is in it's own mod now. It can hold up to 1024 torches and is nice for lighting up the area. Wireless Crafting Grid, for when I'm expending my base and need remote access to my storage, and finally some teleport items like the Advanced Dislocator & Portal Gun. Portal Gun was an early item to use and it's quite nice if I need to drag a mob to some places while the Advanced Dislocator stores quite a number of waypoints to teleport too. I can perhaps better optimize things to free up slots but I was just curious if 12 slots is possible to get. I see! The max amount of slots for the quickslots is currently 10, but there will probably be improvements in the future which allows you to squeeze in 3 of the 4 sized straps.